Keep your electrical panels and breaker boxes securely locked with safety hasps. Lockout hasps are versatile and convenient tools used to lockout an energy source, ensuring that your workers’ safety is never compromised. With Seton’s line of heavy-duty hasps that come in a variety of materials, styles, and sizes, you are sure to find what you are looking for. Safety hasps help give your workers the piece of mind that each energy source is properly isolated. Steel Lock-Outs prevent equipment operation until every padlock is removed. Red 6-hole steel lock-out with no tabs with 8" chain and 1-1/2" dia. hasp. 6 hole aluminum lock-out hasps are non-sparking and ideal for electrical lockout situations. Combines lock-out security with tag-out identification. Dual lock-outs have built-in large and small hasps for double the safety. Steel Lock-Outs prevent equipment operation until every padlock is removed. Yellow 6-hole steel lock-out with interlocking tabs and 1" dia. hasp. 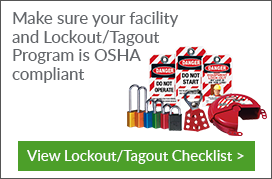 Did you know that using lockout hasps in your lockout/tagout procedures also keeps you compliant with the standards set by the Occupational Safety & Health Administration (OSHA)? OSHA 1910.47 requires businesses to ensure that electrical panels and breakers are regularly checked and secured against unauthorized access. Incorporating aluminium and steel hasps in your lockout/tagout procedure helps you keep your machinery securely locked down when needed. It keeps your employees safe from electrocution during lockout procedures. But remember that the type of lockout device you need depends on your equipment as well as what and who needs to lock out the device. Lastly, keep in mind that the security rating of your hasps should always match your padlock.